This is how I take in a guy’s tee shirt to flatter a girl (i.e. 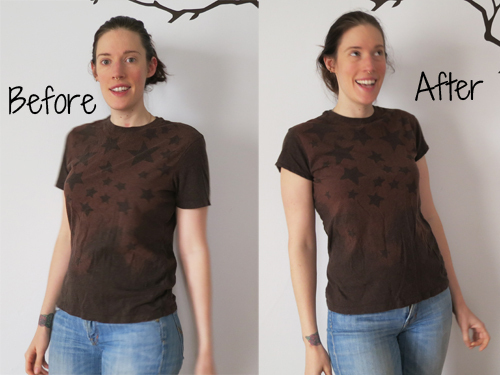 this is what happen’s when I co-opt Adam’s old shirts, as I did for this bleached star shirt). This isn’t about majorly reconstructing a massive shirt to make it tiny. This is about taking a male shirt that almost fits and making a few tweaks to make it more flattering for a female. Adam’s pretty much the same size that I am, and he wears form fitting shirts, so I could wear his old tees without any changes. However, just a few little changes make the shirt much more flattering. The first and most visible step is to change the length and shape of the sleeve. Men’s t-shirts typically have longer sleeves that are straight across. Women’s tees typically have shorter sleeves that often curve over the arm. To get this shape, cut off a triangular wedge from the sleeve, with a smaller amount cut under the arm and a larger amount cut at the top. You can leave the edge raw or finish it. If the sleeves seem all big and gappy after shortening them, you can easily pinch out a little bit from the bottom of the sleeve (instead of reconstructing the entire armhole). If the shirt is already snug across your bust, sew off a little triangle that goes to the existing side seam. If you have a bit of room to take out of the bust, you can bring your triangle in a bit more and then gently taper the seam down to meet the side. To give some shape to the body, there are multiple points that you can take out fabric. The side is the most obvious, however I recommend only taking out a little bit of each side at your waist and gently tapering both up and down. If you pull too much out of the side, the tee won’t hang right as your side seam is too far off grain. My favorite way to give a t-shirt shape is to take darts out of the back. I take out two darts, equidistant from the center back in a soft diamond shape. The exact size of the darts will depend on your own body shape, the size of your starting tee, and how snug you want the shirt to be. I recommend starting small and taking out a bit more if necessary. A very handy tutorial, thanks!! Love this tutorial! Exactly what I was looking for! So easy to follow, so great the result. Thanks a lot! this is simple and easy. thank you….!!! Can you figure out a way to make a mens collegiate t-shirt into a relaxed fit for a woman? You can use the same principles – giving the shirt some waist definition and shortening and curving the sleeves will feminize the shirt.